1, YN-300 adopts 300 high-quality LED light beads of extra-large luminous chips, the brightness is higher, the light spot is more uniform and the service life is longer. 2, YN-300 adopts the encoder digital dimming and can distinguish the rough dimming and fine dimming modes; therefore, the use is more convenient. 3, A built-in light sensing chip can automatically adjust the brightness of the camera light according to the environmental light intensity. 4, The infrared remote controller is configured, thus the brightness and the switch can be adjusted in off state. 5, Professional LED driver IC offers light stability and a light efficiency as high as 93%. 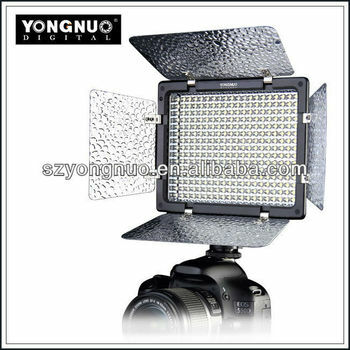 6,The camera light can be mounted on the camera as well as used by a handle. 7, Four color temperature plates are configured and suitable for using under different environments.